4.Are you factory or trading company9 We are factory and also do trading in household area. 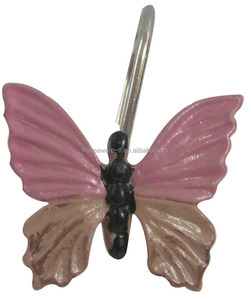 For other items we can provide samples for customer themselves do the test upon official order. 3. Factory cover an area 150 thousand square meters and have more than 1000 workers. We aim to keep offer ing our partners with innovative designed products, sustainable competitive pricing and with good quality. We welcome every partner from all around the world to contact us and seek cooperation for mutual benefits. 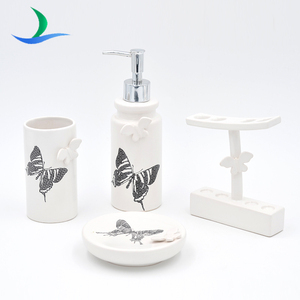 Small quantity of existing bathroom accessories samples are free of charge, buyer should pay the freight cost. 2). Chaozhou Jienaisi Ceramics Co., Ltd.
| When you send us an enquiry, please tell us the packing method you prefer or we can give you the suggestion. | A seasoned production team ensures us to provide our customers with high quality products. | Strictly quality control in every production process will make sure the defects are within the acceptable range. Besides, with more than 10 production lines, we have great yielding capacity to meet our customers&rsquo; demands. Q1: Are you a factory or trading company9 And what is the minimum order of quantity9 A: We are a factory . Q5. Can I get better price9 A: Prices are different for different order quantity and specific demands. Zhejiang Better Plastic Co., Ltd.
Wuhan Tianmei Hotel Supplies Co., Ltd. 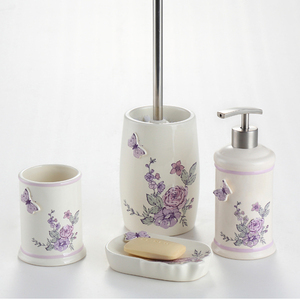 This modern bathroom accessories set is made of high quality non-clear resin. With this modern bathroom accessories se t in your bathroom, you can enjoy the Spring for all the seasons. Most models of our polyresin bath sets are our own designs, however, we can make as per your requests. 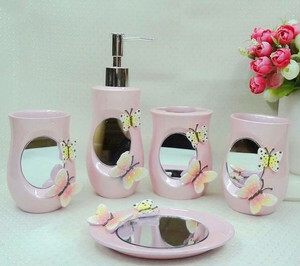 Alibaba.com offers 278 butterfly bathroom set products. About 25% of these are bathroom sets, 6% are shower curtains, and 3% are stickers. 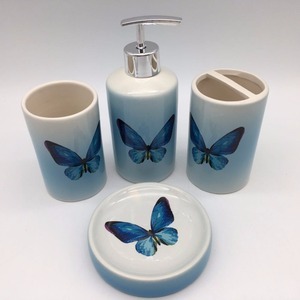 A wide variety of butterfly bathroom set options are available to you, such as 100% cotton, ceramic, and plastic. You can also choose from eco-friendly, stocked. As well as from free samples. 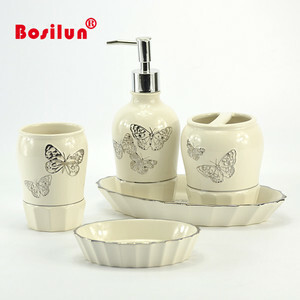 There are 199 butterfly bathroom set suppliers, mainly located in Asia. The top supplying countries are China (Mainland), Taiwan, and Hong Kong, which supply 96%, 2%, and 1% of butterfly bathroom set respectively. 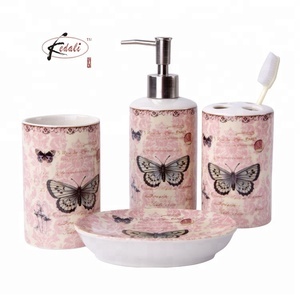 Butterfly bathroom set products are most popular in North America, Western Europe, and Northern Europe. You can ensure product safety by selecting from certified suppliers, including 57 with ISO9001, 36 with Other, and 35 with BSCI certification.